For my next upcoming performance I had to really train as the stage is only 3.9meters deep. That is extremely narrow, especially as it will be a real stage. So I cannot ride to the absolute border in the front, but also not in the back as there will be a wall. I had huge difficulty finding tricks that I could do on such a small space. But with that I can soon start performing in discotheques. I uploaded a clip of my tiredsome practice to the Chinese version of youtube. You will see my friend doing some funny finger movements. That shows you how boring my practice for this show was. 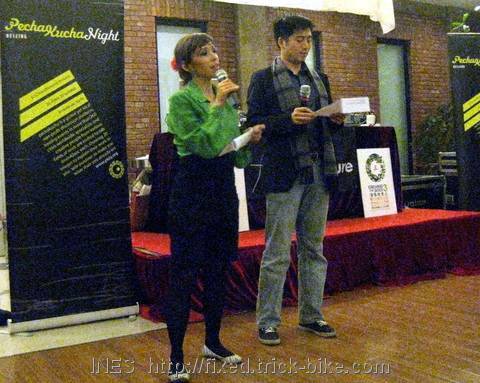 Following the global discussion platform Beijing hosted its 14th PechaKucha Night. As this one was co-hosted together with the Greening the Beige (GtB) closing event the topics were green. 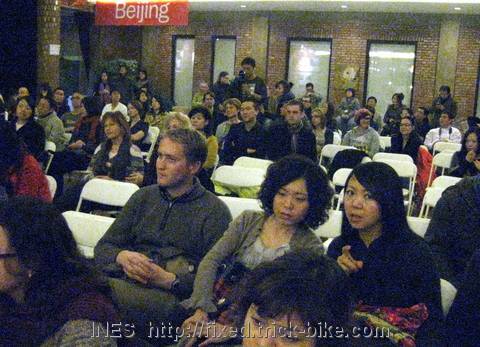 Samantha Woods spoke about the „Green Long March„, Yinghui Zhang-Carraro spoke about „Natural Living in Beijing“, Julien Chol spoke about „Green is More“, and other similar topics. They were all presented in the PechaKucha style: 20 slides a 20 seconds each automatically changing. The speakers had to get to the point and finish within 6min 40sec. Closing a full week of creative cross-over events, GtB’3 wrapped up its 3rd year of events with a recycled film workshop hosted by Electric Shadows. 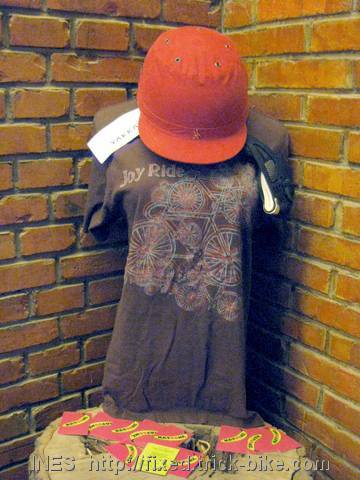 I had set up to mannequins with my cycling t-shirts, Yakkay helmets and Respro masks. There was an eco-fashion show with pieces designed by Beijing local fashion designers WillowWillow and Raffles School of Design. 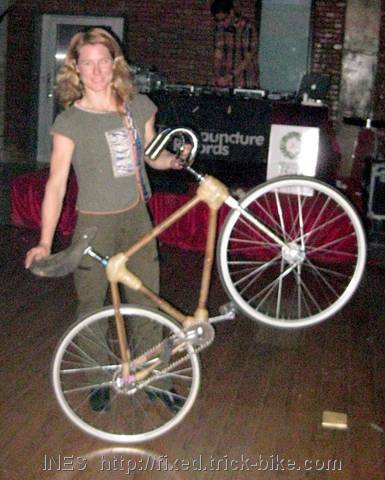 After that I did the world’s first trick bike performance on a bamboo bike! 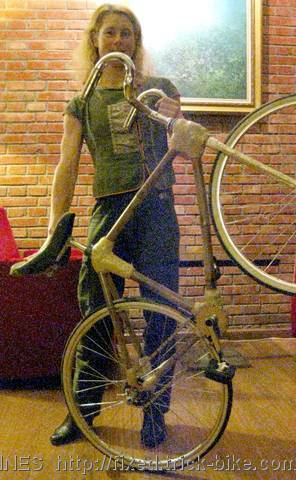 Zack Jiang had made this special geometry artistic bicycle for me so that I can prove that his bamboo bike frames are built stable and they can withhold very strong forces from various angles. 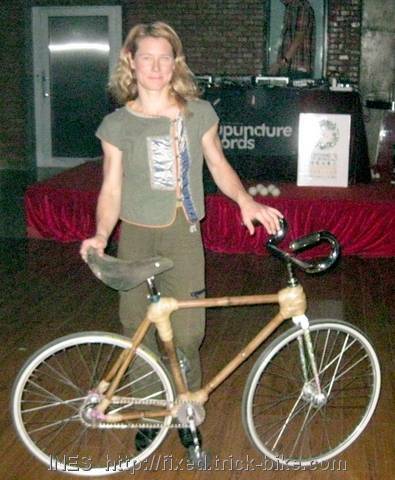 Sure a bike frame made out of bamboo is softer than one made out of ChrMoly or aluminum but it is stable. I was able to do my trick bike performance on it! Congratulations to Zack’s design! One of my trick bike forks had been broken for a few years. I always had it to show people how it can just break. As I now have the trick bike frame that Zack made out of bamboo I thought it might make sense to have this extra fork working again. So I gave it to a welding guy and I told him the fork opening needs to be 100mm. When I came to pick it up it was actually 107mm and optically asymmetric. I asked him if he could do a better job and he said yes. Watching what he then did made my less confident and even after all his efforts it still is 106mm. I will need to try it out like this or find a more professional welder. 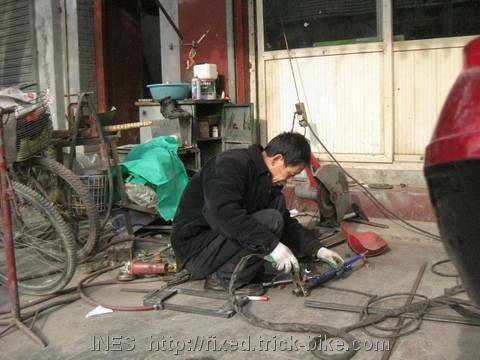 Here is a picture of him working on my blue fork. 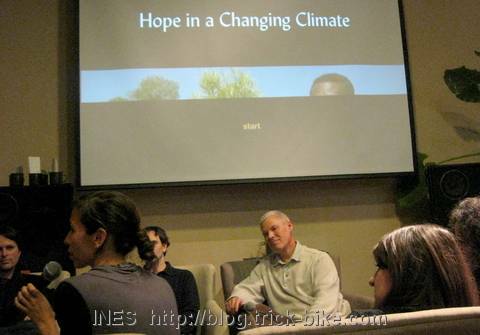 Greening the Beige organized a film screening premier of the film called „Hope in a Changing Climate“ and dinner event. Simultaneously launching on the BBC, Greening the Beige is proud to present this exclusive film premiere from the Environmental Education Media Project. „Earth’s Hope“ is a multi-media initiative working to engage the international community in an integrated approach to poverty reduction and large scale ecosystem rehabilitation. The movie was very touching, impressive and inspiring. My last day in Tokyo. 🙁 I spent the morning online and packing my trick bike as well as my suitcase. Just by looking at everything I had the impression that I might have some luggage overweight. And later at the airport that was proved to be true. I had a very nice lunch with an ex-colleague of mine in Shinjuku. It was very nice to see him and he was very sorry that he had missed all of my performances. Maybe next time as I hope to be back in Tokyo soon. Today was a great first day in Tokyo! 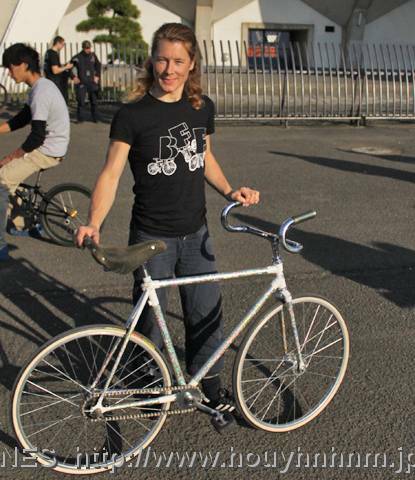 Harumi had organized a fixed gear bike for me to use. So I was able to ride around. I cycled through the city to the location for the dinner without any problems. 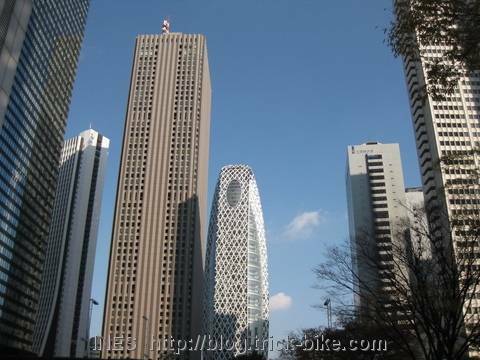 It was really nice to cycle in Tokyo. The drivers actually wait for you to ride before they turn, nobody cuts you off, (except for one van) they all blink before they change lanes or turn. There are no cars driving on the wrong side of the road nor any electric tricycles driving at high speed in the opposite direction on the bike lane. And the pedestrians stop on the side walk when the light turns red, nobody jumps onto the cycling lane or suddenly runs across the street without looking. Really amazing experience compared to China. Also Tatsuya and Satoshi from the local organizing team said some words to all participants. 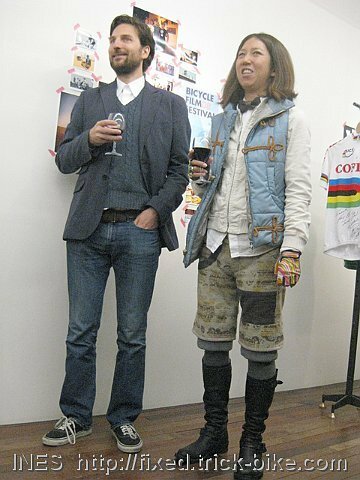 They are both cycling messengers at Courier Tokyo, the ones that started the bicycle film festival in Tokyo 5 years ago. It was great to meet some old friends that I had last seen over 2 years ago. Benny Zenga and Brian Vernor are the directors of the beautiful movie „Where are you go“ about the 4 month long Tour d’Afrique bicycle race from Kairo to Kapetown. There was a surprise performer doing electrifying tricks that he was claiming were not magic nor tricks. Everybody was amazed. When almost everybody was gone we took some pictures of the remaining guests. More of my pictures are in a webalbum. 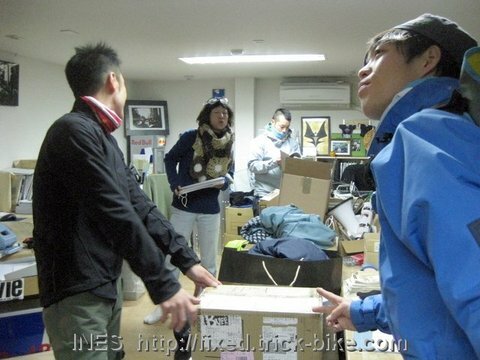 And then I went with some of the bicycle messengers to the courier office to get some of my clothes out of my trick bike bag. 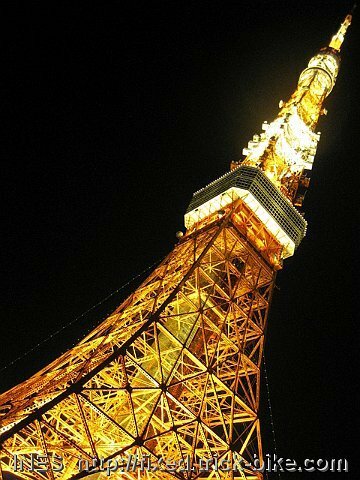 Then the courier Papas showed me a better road to cycle to Roppongi from which I cycled home via the Tokyo Tower. The road was slightly longer but more flat than the road I took to get there and this road had a better bike lane. At Harumi’s home I enjoyed the internet access to facebook and youtube and vimeo. So much fun! 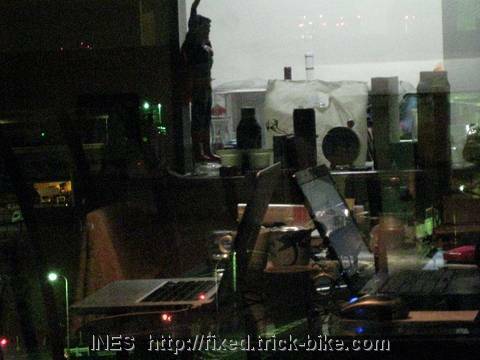 I liked the reflection of the apartment in the huge window with the street lamps and street shimering through. Do you see superman standing almost in the center? Today I arrived in Tokyo and was picked up by Harumi. We only dropped my luggage off at her place and then went directly to a vernissage. 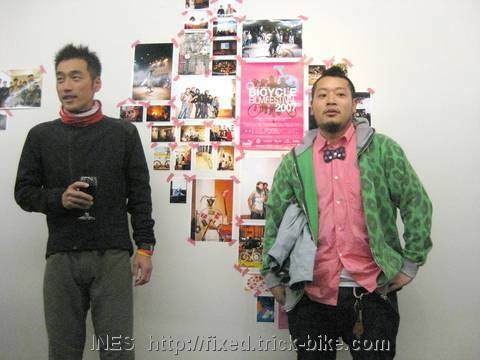 The Japanese artist, cyclist and monk as well as BFF friend Ko Masuda does art around cycling. 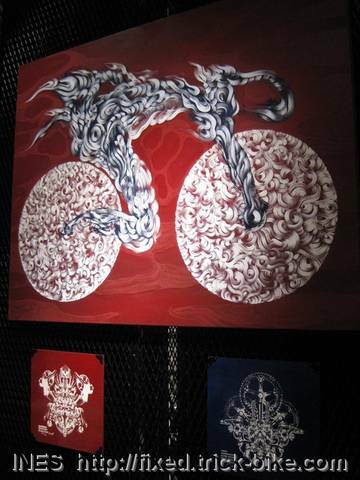 He beautifully engraves handlebars and stems as well as paints on canvas and bicycles. His paintings are all about bicycles or cycling. They are very energetic. 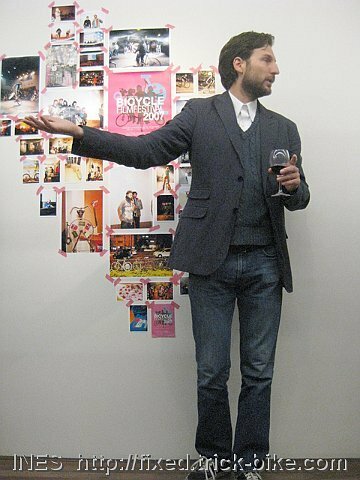 He is having an exhbition in Aoyama Tokyo. 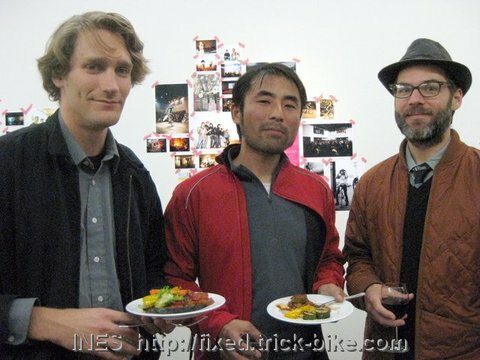 The Tokyo 2009 bicycle film festival (BFF) crew came to the art exhibition opening party. 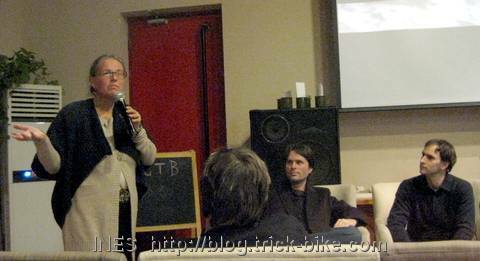 I took only a few pictures which I uploaded to a webalbum here. 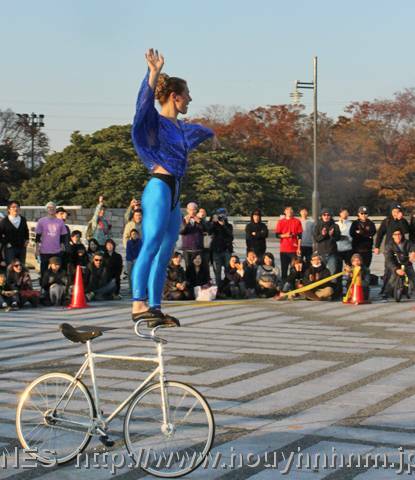 The international Bicycle Film Festival (BFF) is coming to Tokyo. This festival all around independent creative bike short films and parties will be from Friday November 20th to Monday November 23rd. 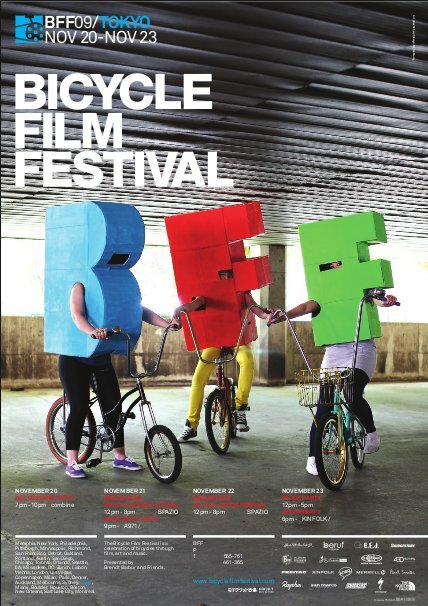 The BFF is a celebration of bicycles through film, art and music. Presented by Brendt Barbur and friends. And I will be going to Japan to perform! 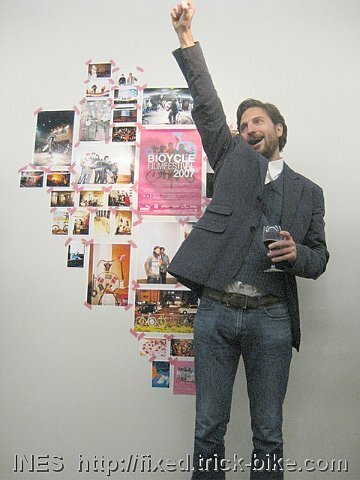 I will be doing a very small show (dance around a bike) on the Friday Nov 20th at the BFF opening party in Combine. 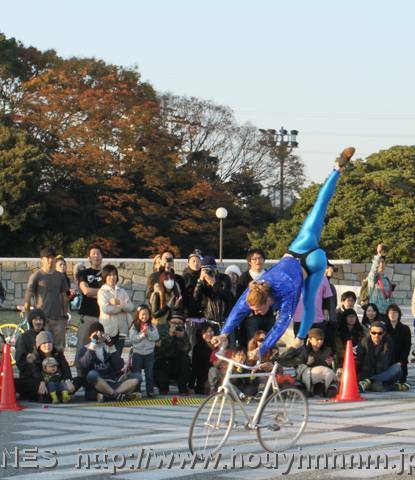 I will do bike performances at the Block Party on Monday Nov 23rd at Komazawa Koen Park. I hope there is no rain… I am keeping my fingers crossed. 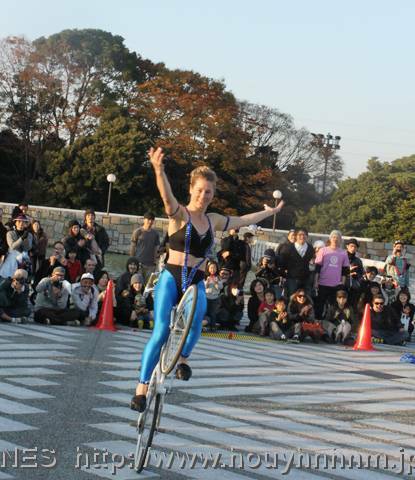 I should be performing 2 trick bike shows, one at 1pm and the second at 3:30pm. And there are 2 full days of different movie screenings on Saturday and Sunday. The full event schedule details can be found here. Hope to see you in Tokyo! 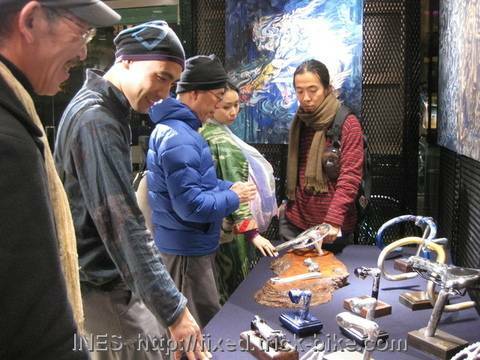 Today I had a very nice couple come into the Natooke shop. 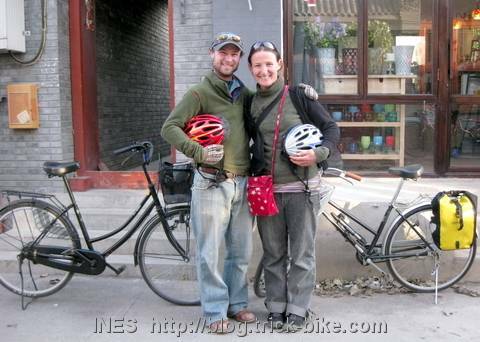 It was Sarah and Roly from Australia that had gone to Tokyo and bought 2 refurbished single speed mama-chari bicycles. Then they cycled all across Japan through all the mountains. They said they had never experienced such polite car drivers. They said they think Japan is the best country in the world to cycle. Then they took the ferry to South Korea and cycled there. The car drivers were not used to cyclists and did not really leave them much space on the roads. 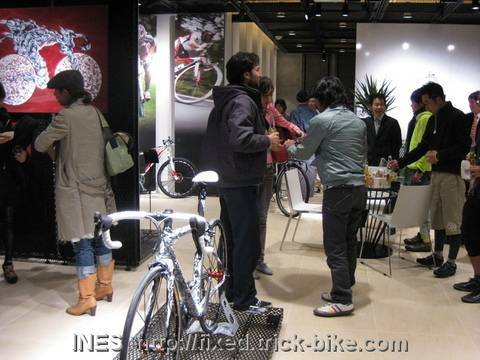 Then they came to China and cycled to Beijing and came by chance to my bicycle shop. This was the last picture of them with their Japanese bicycles as they were on the way to dropping them off to be sold for a good purpose. They will continue their trip through Asia a little bit later and they were considering riding old durable Flying Pigeons. I wish you guys good luck and lots of fun! Keep your love for cycling! 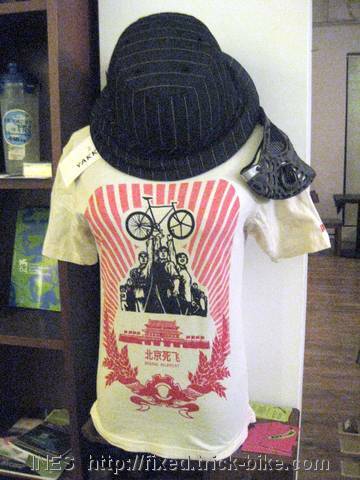 You are currently browsing the China, Asia, Climbing and Fixed Gear Bikes blog archives for November, 2009.